Bank buildings -- California -- Fresno County -- Photographs. ; Historic buildings -- California -- Fresno County -- Photographs. ; Streets -- California -- Fresno County -- Photographs. ; Fresno (Calif.) -- Buildings, structures, etc. -- Photographs. A 1920's Fresno street scene viewed from the corner of Van Ness and Tulare. To the right is the U.S. Post Office with the Patterson Block further up the street. The tall building in the background is the Bank of Italy building, constructed in 1918 at the northwest corner of Tulare and Fulton. To the left on the southwest corner of Tulare and Van Ness is the Fresno Morning Republican Newspaper. 1 Photographic print (postcard) :b&w ;9 x 14 cm. This image is being made available for educational and research purposes only, under the ?fair use? clause of the U.S. Copyright Law (Title 17 ? 107 U.S.C.) Further questions regarding the image or its use may be directed to the California History and Genealogy Room, Fresno County Public Library, 2420 Mariposa St., Fresno, CA 93721-2285; (559) 488-3195, press #3, then #5. 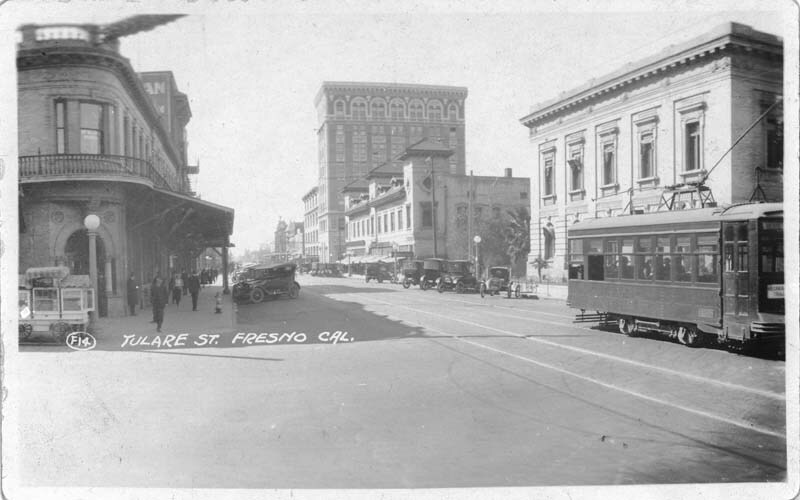 “Tulare Street Fresno California,” San Joaquin Valley Library System Digital Collections, accessed April 18, 2019, http://digital.sjvls.org/document/1762.